Some people will open a party invite with a warm smile, which sours to feelings of dread when they reach the dress code section and it stipulates: smart casual. For some men, it's hard to know exactly what that means and it can appear a little difficult to know which parts to match at first. We hear the phrase bandied about and it seems that smart casual is one of those styles that’s pretty hard to define. But the good news is that in the twisted face of confusion, there are now a wealth of established examples of killer smart casual combinations. So now we can get a good idea of what works and what doesn’t. Smart casual is actually a lot more flexible of a look than you might first think. Here are a few suggestions on the best smart casual outfits for men. Smart jeans exist. Sporting a Tee-shirt with a snazzy blazer on top is a perfectly acceptable combination. This short introduction will give you plenty of ideas on how to dress smart casual and hopefully then the confidence to start playing with a few motifs and make them your own. There are a few ground rules when it comes to this particular dress code. Jeans can be much more versatile than people think, and can easily be paired with blazers of various colours. As a general rule of thumb if you're making your top half more causal, then the smarter the bottom - the better, and vice versa. A plain blazer and a textured jumper work well together, especially if you keep both of them slim-fit and neatly tailored. A blazer and jeans is great mix of two ends of the spectrum. A blazer tends to be worn with smart trousers, while jeans are the go-to weekend wear. But jeans have been used in smart casual outfits for years - and if you pick a slim fit pair, made from a quality denim - without distressed or faded features - they will no doubt work well with a simple blazer. It’s a good idea to stick to similar tones with your jeans and blazer. But, if you don’t like things to match too much, then just try to make sure that your jeans are a darker shade than your blazer. This will ensure you don’t create a top heavy finish to your look. The golden rule here is - choose a good quality Tee. This means picking one that’s preferably 100% cotton - so you’re adorned in a breathable, sturdy, yet comfortable material. It also means making sure it will fit you perfectly and last longer than a cheaper option. Anything too loose will look messy, anything too tight will look awkward, anything overly colourful will look too casual. Also remember anything stained will just look like you don’t know how to dress yourself. A well-fitted white T-shirt is perfect, and easy to pick up from stores. This can prove a tricky combination to pull off - as you’re essentially taking one of the smartest pieces in menswear and pairing it with one of the most casual. But fear not - this can work amazingly well together - as you see at most music awards ceremonies. When you get the look spot on - you will look both sleek and the prefect definition of not trying too hard. But it's all about getting the prefect pair of smart trainers. Go for a pair with a bold and solid colour. You can find plenty of classic and smart trainer styles at online retailers like Uppersole. The key to making this combination work is to keep everything simple. Keep to neutral tones and plain finishes. White trainers matched with a classic navy suit can work surprisingly well and it creates a look that’s laid back, but not so much that it’s not office appropriate. 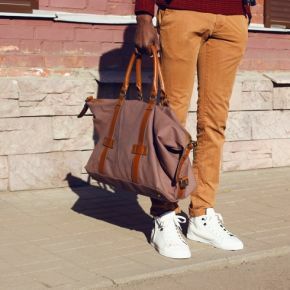 Bearing all the above in mind - it should help you to see that for all the tips and things to avoid - dressing in a smart causal style for men and pulling off a killer style isn’t too difficult. With many combinations available to you - there’s little excuse for you to not try out a different look from time to time.